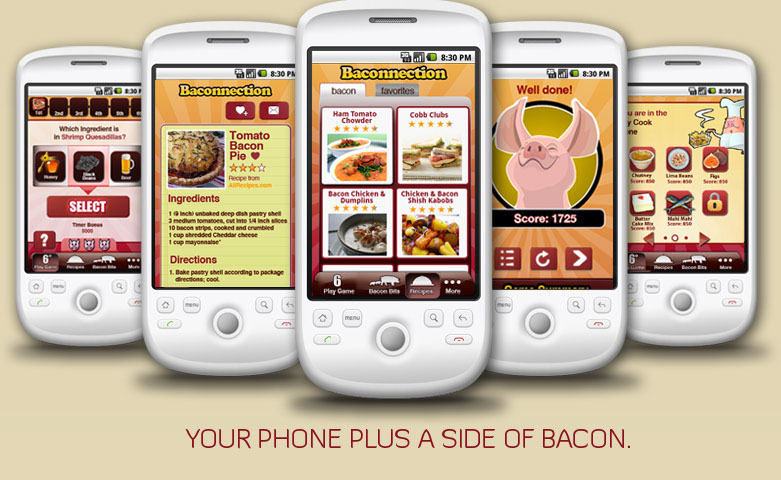 Baconnection - The App for Bacon Lovers! An app for bacon lovers? Baconnection is available on the Android market right now and it looks like so much fun! I will hope that they develop it for iPad sometime in the future. So... what does it do? I DON'T KNOW BECAUSE IT'S NOT ON ITUNES! We've assembled an incredible variety of recipes with bacon in them, from bacon soups to bacon salad, bacon wrapped treats to bacon wrapped meals, bacon burgers to bacon pasta, even bacon with chocolate. No matter how much you already love bacon, you'll discover new ways to cook bacon and new ways to make bacon delicious. Bacon Bits lets you snack on bite-size trivia quizzes. You won't believe how many fun bacon facts you'll find out. 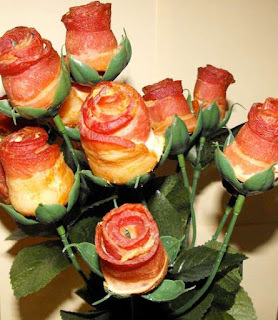 You've never enjoyed bacon like this before. 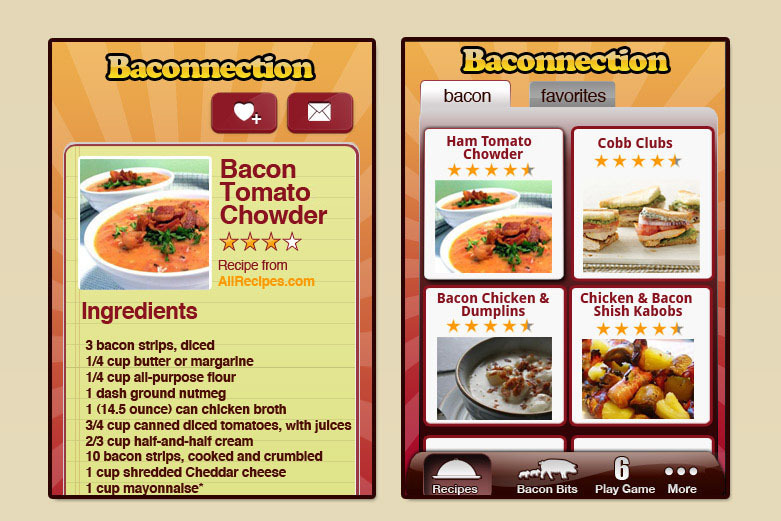 Baconnection™ is a fun new riff on a familiar game, challenging you to make "Baconnections™" between the unlikeliest ingredients and bacon. Can you link from guacamole to bacon in six recipes or less? How about scotch? Mahi mahi? The higher your score, the cleverer your connections, and the faster you fly, the more likely you are to win fun badges. Can you become a Baconnoisseur? And it's only 99 cents. Well what do you know? I posted on Baconnection's Facebook wall asking after an iTunes version and they responded nigh immediately! Look! Look! As luck would have it dear Bacon Goddess, an iPhone version is on it's way and should be available the second week of May. We'll be sure to post on our fan page once we've got final approval to go live in the iTunes store! Stay tuned! First off, thanks to EVERYONE who sent me the photo. But special thanks to Jessica for finding the instructions to make these! It actually looks pretty easy to do! I'm not sure that I will try this, but it's nice to know how - just in case. Look at this. Would you just look at this beautiful thing! 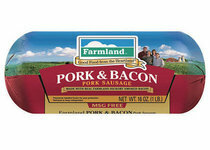 It's like a heavenly union of breakfast meats! Pork and Bacon Sausage Roll is available nation-wide - just put your zip in the store locator and it will spit out where to find it near you. I believe that we will be having this for breakfast next weekend. With biscuits and gravy I think. Sausage bacon gravy. Then we will have a review. 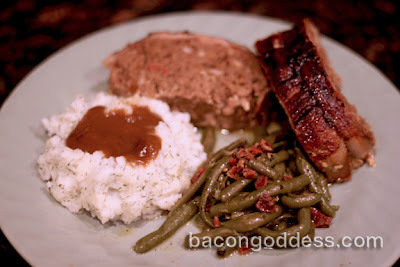 My friend Henri of the bacon-wrapped meatloaf recipe found this. I have awesome friends. Why yes, that IS bacon in those green beans! One day my friend Henri posted a recipe. It was a recipe for meatloaf. I like meatloaf. I continued to read the recipe... what's this? 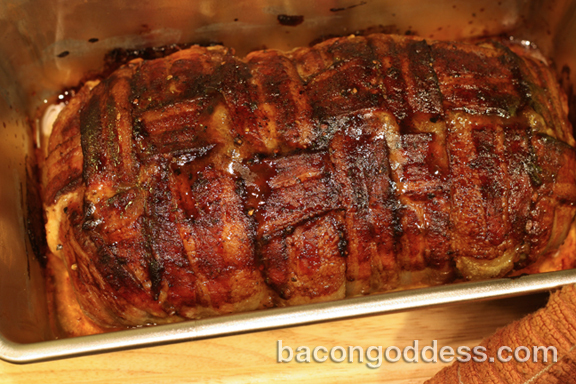 Meatloaf wrapped in BACON? Yep, I had to make it. It is delicious! Henri said it was cool to share the recipe here, so here it is! I halved the recipe (only two people eating this) and used hot sausage (because it was all I had). I only had plain bread crumbs, so I tossed in a bit of oregano, basil & thyme and mixed it up to get the same basic flavor. Really, you can use any kind of breadcrumbs you want. 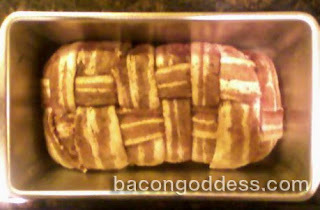 As you can see from the picture, I decided to do a bacon weave on the meatloaf instead of strips. Because I think bacon weaves are the coolest thing ever! I used Wright Brand bacon for this. Okay, it says NO SUBSTITUTIONS for the PickaPeppa sauce and I'm totally standing by it. This sauce is amazing and it works incredibly with the meats and the bacon to add a flavor that is nothing short of heavenly. It just won't be the same if you don't use PickaPeppa! Finished product? Here it is! Swimming in delicious bacon grease! This is possibly the best meatloaf I've ever eaten. My husband said it was so good he didn't even need ketchup.